Friday was the first full day of movies at the Arthur Lyons Film Noir Festival, following a terrific opening night screening of HOLLOW TRIUMPH (1948). We kicked off the day with breakfast at Elmer's. This is a chain we enjoy on our visits to the Pacific Northwest; the lone Elmer's in California happens to be in Palm Springs. The food and service are always reliable, and I recommend it to future festival visitors. After breakfast we had time for a quick drive past Frank Sinatra's famous Twin Palms Estate, which is on the National Register of Historic Places. The house has a film noir connection: The exterior appears as Steve Cochran's home in THE DAMNED DON'T CRY (1950). Speaking of Steve Cochran, he was one of the stars of the first movie of the day, THE CHASE (1946). Robert Cummings, Michele Morgan, and Peter Lorre costar in this dreamlike, atmospheric film noir. 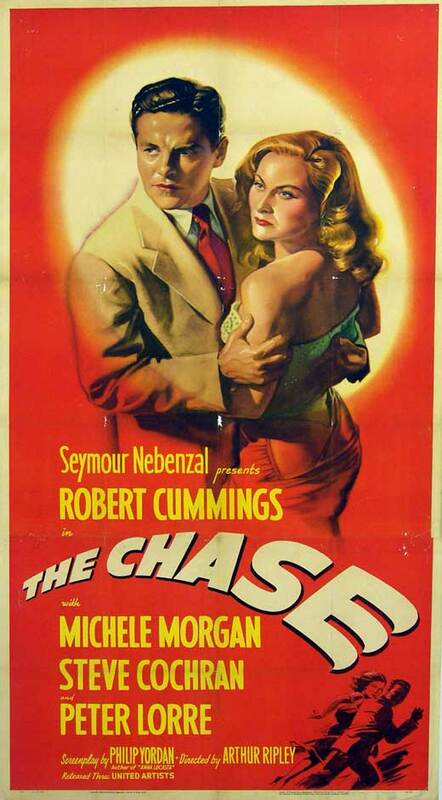 I had the good fortune to see THE CHASE in a theater on two previous occasions, and in fact it was mentioned that the print had been screened a lot in the past four years and thus wasn't pristine. Despite that, I thought it still looked terrific, and it's a film I continue to find mesmerizing. There's something strangely magical about touches such as Cochran's literal "backseat driving." An unforgettable film noir. In between films, one of the highlights of the day for me was the chance to have film historian Foster Hirsch autograph his books. As I mentioned in a post on the 2015 festival, I've had two of his titles from the Pyramid Illustrated History of the Movies series on my shelf since I was a young film fan. He graciously signed them for me, along with his classic book THE DARK SIDE OF THE SCREEN: FILM NOIR. I saw 10 of the 12 films shown at the festival; one of the two films I decided to skip was Anthony Mann's SIDE STREET (1950). I had seen it fairly recently, and while I enjoyed several aspects and it's definitely worthwhile, I confess it's not a favorite for me. After dinner it was time for the final film of the day, BLACK ANGEL (1946). Like THE CHASE, it was my third time to see it on a big screen. This film is a tremendous favorite of mine which I continue to find rewarding each time I revisit it. It was my husband's first time to see it, and I was especially happy that it was one of his favorite films at the festival. BLACK ANGEL stars the great Dan Duryea along with June Vincent, Peter Lorre, and Broderick Crawford; as it worked out, it was the second film of the day featuring both Lorre and Crawford. As I mentioned in my introductory post, Richard Duryea was unwell and forced to cancel his planned appearance. In his introduction Eddie Muller shared Richard's reminder that, despite his father's bad guy movie reputation, "I was raised by Ward Cleaver." I had the good fortune to see Richard Duryea interviewed at the Noir City Hollywood festival in 2014. I send him my very best wishes. Coming next: A look at the Saturday lineup, plus a review of ALL THE KING'S MEN.